App search engines for individuals with special needs are fortunately becoming more prevalent, aiding in the search for “just the right app” for your mTool Kit. 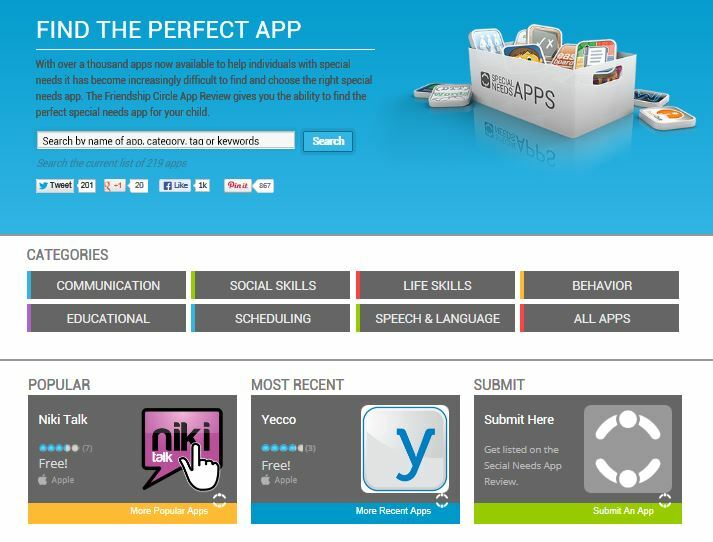 I recently stumbled upon the Special Needs App Review search engine, a new tool for finding apps developed by the Friendship Circle, a non-profit, national organization. 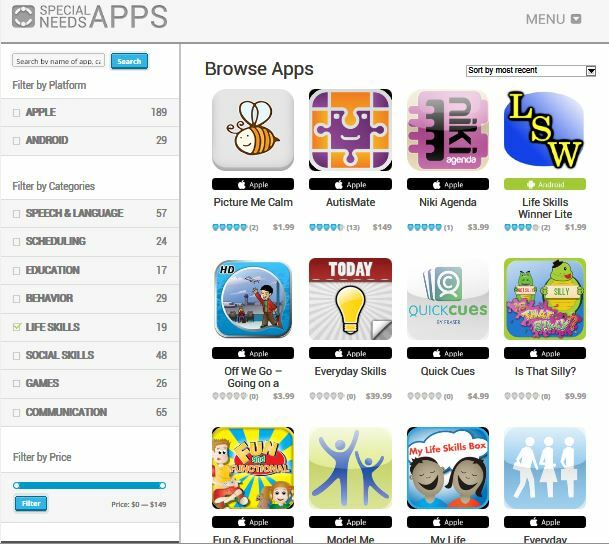 The Special Needs App Review currently has eight categories as seen below along with Popular and Most Recent apps featured. 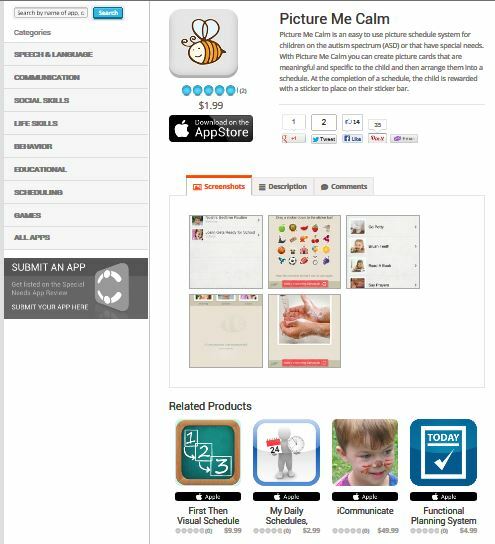 Apple and Android apps are available for review. Currently there are about 200 apps reviewed with more Apple than Android. Some apps were rated and others not. Platform and cost are listed on this main category search results page. Other similar apps are offered at the bottom of the screen. Links to the app in iTunes is immediately available for more information or purchase. Although the numbers of apps available in the search engine is currently limited, this Special Needs App Review provides another choice for app search and review. 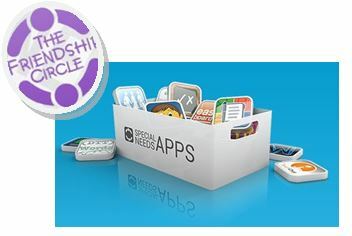 The developers, the Friendship Circle are a reliable source for reviewing apps having expertise in supporting individuals with special needs. Their blog Friendship Circle – Special Needs Blog provides a wealth of information on parenting, products, resources, special education, therapy tips, legal and planning and more as related to individuals with special needs and those who support them. It is well worth the visit with something for almost everyone offered in the Friendship Circle Blog. Resources for searching for tools for your teaching or OT mTool Kit! This entry was posted in Android, App Reviews, App Search Engine, Apps for OT's, Apps for Special Needs, Game, iPad, iPhone, iPod, Life Skills, Occupational Therapy, Social Skills, Special education and tagged Activities of Daily Living, Android, App Review, App Review sites, iPad, iPhone, iPod, Life Skills, occupational therapy, OT Apps. Bookmark the permalink.